Meizu is celebrating a big milestone in 2018 - 15 years since the company was founded back in 2003. 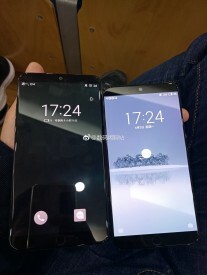 To properly mark the occasion, it's preparing to launch a couple of new smartphones, aptly named Meizu 15 and Meizu 15 Plus, respectively. These have been leaking at a steady pace in the past few weeks, and today we get three more hands-on images showing them. As you can see, the Plus model will be unsurprisingly Plus-sized. For both it and the Meizu 15, the front-facing camera is centered above the screen, while the bottom bezel houses a round Home button. The devices have an all-metal build, and their dual rear cameras are vertically aligned in the upper-middle part. Under them is Meizu's classic ring-shaped LED flash. 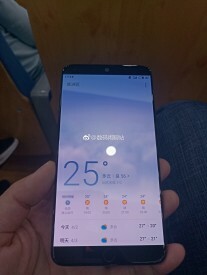 The Meizu 15 Plus will allegedly sport a 5.95-inch QHD touchscreen, 12 MP + 20 MP resolution for those rear cameras, a 20 MP selfie snapper, and a 3,430 mAh battery. At the helm we'll see Samsung's Exynos 8895 SoC, paired with 4/6 GB of RAM and 64/128 GB of storage depending on which exact variation you buy. The smaller Meizu 15 comes with a 5.46-inch 1080p display, and might be powered by the Qualcomm Snapdragon 660. The RAM/storage options are the same as for its bigger sibling, but the battery capacity takes a hit because of the size constraints - it's 2,940 mAh in the Meizu 15. 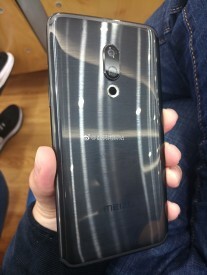 A lower-end Meizu 15 Lite may join the two when they get officially outed before the end of this month. Oddly enough, the follow-up Meizu 16 "ultra-flagship" series will apparently come in August, according to Huang Zhang, the company's founder. That feeling when you realize the Meizu 15 won't be really compact with 5.46" screen because it has the 16:9 aspect ratio.